While living in Los Angeles, looking for a “real” job, and working minimal hours to make a few cents, I had a lot of time on my hands. LA is one of the worst places to live if you have no money, because you KNOW there are so many amazing, awesome, fantastic things happening within minutes of your apartment, but you can’t afford to actually DO any of them. But I did have a Jo Ann very close by, and I spent a lot of time crocheting. I’ll probably document some of those projects at a later date, because this post is about sewing. I’ve always, always, always wanted to learn to sew, but beyond learning a few basic hand stitches and once making a very simple cloak with a family friend, the mysterious art of sewing eluded me. I’ve had a fascination with costumes my whole life, from the beautiful dresses featured in Lord of the Rings, to the iconic Jedi robes of Star Wars lore. It’s been a secret dream of mine to someday make an elaborate, amazing Halloween costume, and be able to say that I made it. It probably stems from a subconscious desire to actually become the brave, loyal, courageous characters of my favorite books and movies. In any case, I promised myself that if I moved back home to Wisconsin, I would finally pull out my mom’s old Singer and teach myself to sew. Well, I’m still a bit timid, and socially awkward, and indecisive. And I still have a slight obsession with cats. But I kept my promise and am LEARNING HOW TO SEW!! 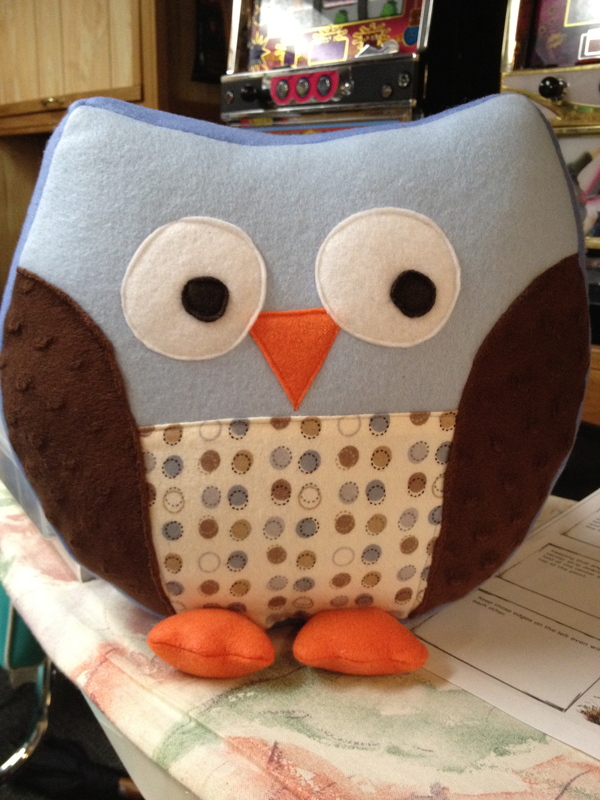 AN ADORABLE WOODLAND OWL PILLOW! My cousin just had her first baby; an adorable little boy, and his room is “woodland animal” themed. When I saw this pinned on Pinterest, I knew it was exactly what I wanted my first major project to be. You can find the blog post with the pattern on the Make it and Love It blog HERE. I’m still amazed with how well this turned out, and family and friends are even more amazed than I am! I’m so in love with this, that it’ll be a little hard to give it away! But I made it for baby Blake, and his new woodland forest themed home is waiting for him! Wanna see another angle? BAM! I actually finished this project about a week ago, and I’m still riding the high of making something so awesome with a sewing machine, a plethora of sewing accessories, AND MY OWN BARE HANDS! So. I figured I would share my excitement with the interwebs. And I’ve done that. 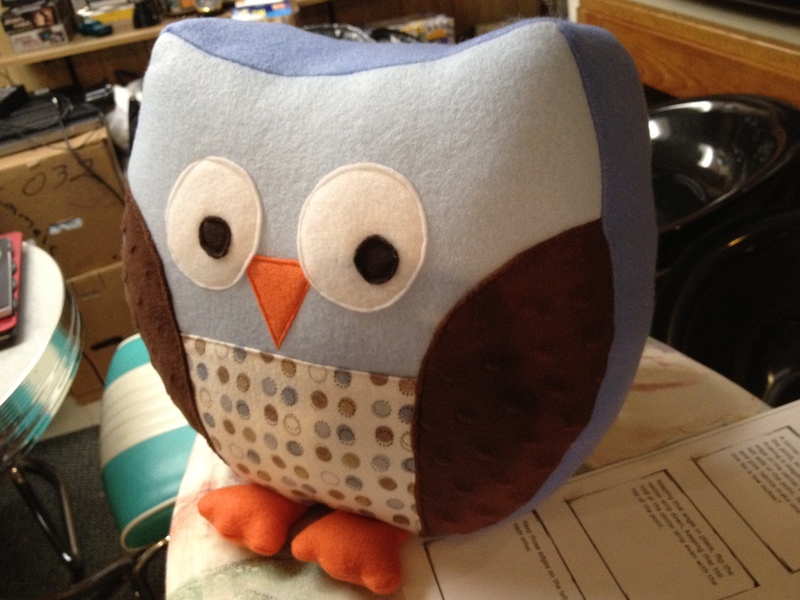 Now please excuse me while I go squeeze this pillow and “squee” like a little girl.